TMJ discomfort is the pain associated with Temporomandibular Joint Syndrome. The Temporomandibular Joint (commonly referred to as TMJ) is the joint where the mandible (the lower jawbone) meets the skull. If you put your fingers directly in front of your ears on the side of your face and open and close your mouth you can feel this joint in motion. Issues associated with TMJ Syndrome are frequent morning headaches, tightness in your jaw, jaw pain or discomfort, facial and/or ear pain, and a clicking sound while eating. 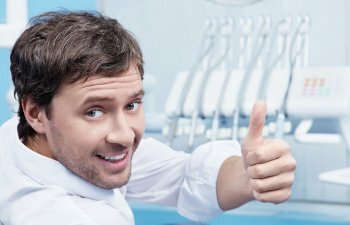 At Gold Hill Family & Cosmetic Dentistry we offer our patients effective, long-term relief from TMJ discomfort through an extensive examination in order to diagnose the underlying causes. Many people experience ebbs and flows in their TMJ symptoms, yet in most cases it continually gets worse over time. TMJ syndrome is most often caused by a misaligned bite. Misalignment in the upper and lower jaws can put undo stress on a portion of the jaw so that it is being overworked or over stressed. Many people who experience a clicking sound on one side of their mouth while eating will simply chew their food on the other side. This one act of compensation puts added burden on one half of your mouth because food should be chewed evenly. The jaw is used frequently throughout aside from eating: talking, laughing, yawning, opening the mouth for tooth brushing and flossing, etc. Because of this frequency of use, jaw pain can be felt any time during the day or night for TMJ sufferers. At Gold Hill Dentistry, we are here to treat your TMJ syndrome successfully so that you find relief from your discomfort. Our practice is dedicated to helping you achieve ultimate oral health – and that goes well beyond just having clean teeth. Because TMJ worsens over time, the sooner you begin treatment for this condition the better. Call our dental practice today to schedule an appointment and be on the road to finding relief.